Kidzworld reviews Krampus. What if Santa were replaced in your house by a creepy version, a far from jolly entity who takes, not gives. Should watching this film be an alternative holiday tradition? 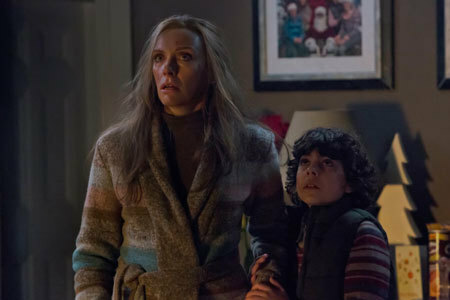 When tween Max (Emjay Anthony) gets fed up with his dysfunctional family at Christmas, he just wishes the whole holiday would go away. Listening is the anti-Santa, an ancient demon named Krampus who really knows how to make the Holidays hell. With four days until Christmas, a dysfunctional family dreads getting together. 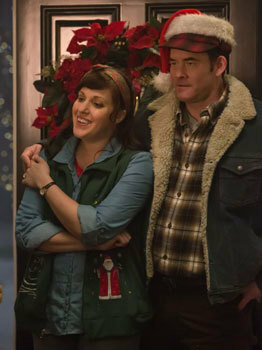 Dad is Tom (Adam Scott) and mom Sarah (Toni Collette), there are kids Beth (Stefania LaVie Owen) and Max (Emjay Anthony) and they are invaded by Sarah's sister Linda (Allison Tolman), her husband Howard (David Koechner), their kids Stevie (Lolo Owen), Jordan (Queenie Samuel), Howie Jr. (Maverick Flack), their baby Sarah and surprise guest Linda's aunt Dorothy (Conchata Ferrell). Overlooking it all glumly is Tom's Austrian mother called "Omi" (Krista Stadler). Every time tween Max tries to cue in the Holiday spirit, his family members argue or just put a damper on anything joyous. His visiting cousins make fun of Max’s continuing belief in Santa so he swears off and tears up his Santa letter. No Santa, no Christmas for him. Soon after, a huge blizzard cuts out the town power. Beth, concerned about her boyfriend who lives nearby, leaves to see if he is okay. On the way, she is attacked by a mysterious monster…with hooves for feet! When Beth doesn’t return, Tom and Howard go out and find her boyfriend’s house destroyed. The men go home and board up the house. They’ll look for Beth in the morning. Howard is supposed to keep watch but falls asleep, the fire in the fireplace dies and young Howie is yanked up the chimney on a hook! Omi knows that the family is the target of Krampus, an ancient demon that punishes those who are bad or have no happy spirit at Christmas. When she was young her poverty caused her to deny Christmas spirit. As a result her family and the whole town were dragged into hell. Only she was spared, apparently to tell the story. In the attic, all crazy hell breaks loose as the family members are attacked by evil toys. 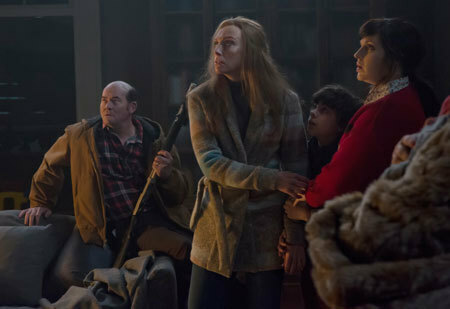 Krampus’ “elves” invade and many family members are attacked and grabbed. The remaining family decide to make a run for freedom inside a snow plow nearby. 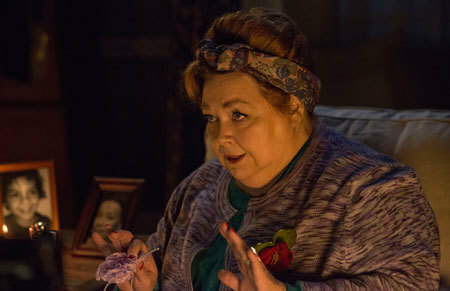 Grandma Omi stays behind and confronts Krampus but she is also attacked. 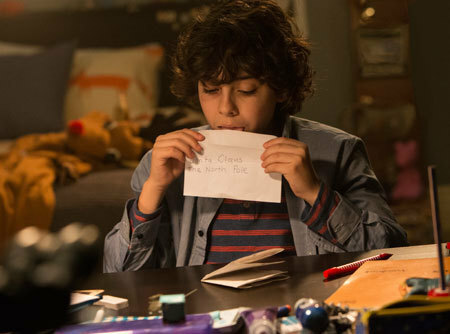 Finally only young Max is left and the monster leaves him his torn-up letter to Santa that he threw away. Max begs the demon to take him instead of his family. It was he who denied Christmas spirit. Will everyone be spared? Alternate Ending – let’s say this ending removes some of the fantasy from the original ending. I like the original better. Deleted and Extended scenes – Usually just longer versions of what is in the film. Nothing great. Gag Reel – These bloopers are cute and worth a watch. 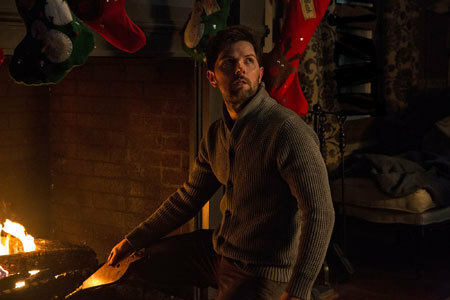 Krampus Comes Alive – This is the multi-part, “making-of” featurette. The director talks about the real folklore that inspired the lead demon and wanting a fun mix of horror and comedy in his film. The cast gets together, talks characters and bonds on set. We see how puppetry was used to operate Krampus with the aid of a guy inside the suit seeing the world on a tiny monitor as he wanders around on his hoof legs. Fun! The elf performers show us how they worked their costumes and we see how a sharp-toothed, evil teddy bear was made along with other creepy toys and meet the puppeteers who worked them. The stunts, mostly by the monster cast, are taken apart and we get a look at miniature scale production design that built a whole town on a sound stage. Behind the scenes at New Zealand’s WETA workshop gives us an even more detailed look at the design and execution of Krampus and his minions. Very complete and interesting extra featurette. Audio Commentary with Director and Co-Writers – These filmmakers relay some fun stories from the shoot and talk tech, cool performances etc. Worth a listen. 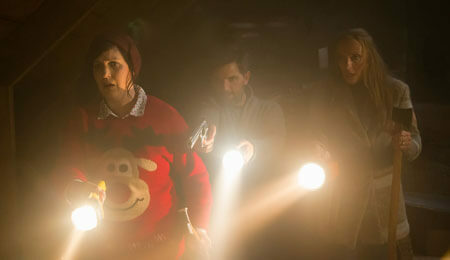 Krampus is a bit like some of the ‘80’s holiday horror-ish, dark comedy classics like Gremlins. It could have used more punch but might have then lost its PG-13 rating. There are some mild laughs midst some real, kinda creepy danger. The cast is excellent. 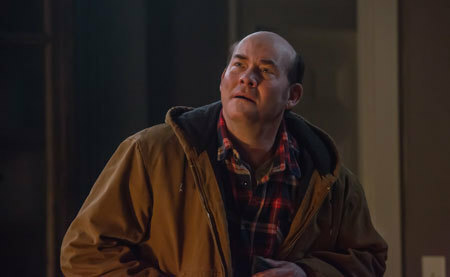 Toni Colette is convincing, Conchata Ferrell is the perfect cynical auntie and David Koechner is really funny as the gun-totin’, smart-talking family member. The extra features on this Blu-ray are sometimes better than the movie in that we get to really SEE the Krampus costume and others in detail and learn how they were made and operated. The film is so visually dark and blizzardy that we only get glimpses of how really cool Krampus and his toy and elf minions really are. It is worth it to buy this set to enjoy the effects and costume wizardry. The villain is quite unique and for him alone, we go 4 stars. Krampus is now available on Blu-ray & DVD! Do you enjoy a little creepy break from holiday joy? Do you appreciate cool monster costumes and puppetry? Leave us a comment. Good vs. Evil - Who's Cooler? Evil is always the coolest. Whichever side has elves is the coolest! I'm way cooler than anything else.